Thank you to the Essex Quadrant Lodge!! Frank Guest from the Essex Quadrant Lodge, part of the Essex Freemasons, called in with a cheque for Hamelin Trust for £250!! 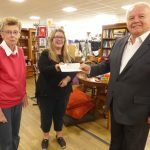 Jackie and Dinah were more than happy to receive the cheque from Frank and Hamelin Trust would like to say a massive thank to the Essex Quadrant Lodge for their donation and for thinking of Hamelin Trust.